If you haven’t thought about installing a stone patio, then we invite you to take a few seconds to think about all the mowing you do…now think about how a patio could save you so much time and effort. Plus, it automatically gives your landscape a more sophisticated look, and allows you to entertain outside without the worry of guests tripping over uneven ground or stepping in mud. To really get the most out of your patio, however, it should include a fire pit or fire table addition. It’s an unfortunate reality that most of the year in Minnesota is spent layering up. Minnesotans still love the outdoors, though, even if it means dealing with the cold. Having a warm fire ready to go just outside your home makes it so much easier. When placed on the patio, it becomes an amazing lounge area for family and friends. But why a paver patio and not a slab of concrete? Simple: the freeze-thaw effect. It’s the reason why our roads are always under construction—one large slab cracks more than smaller pavers professional placed together. Plus, you can customize it to your taste with size and color. 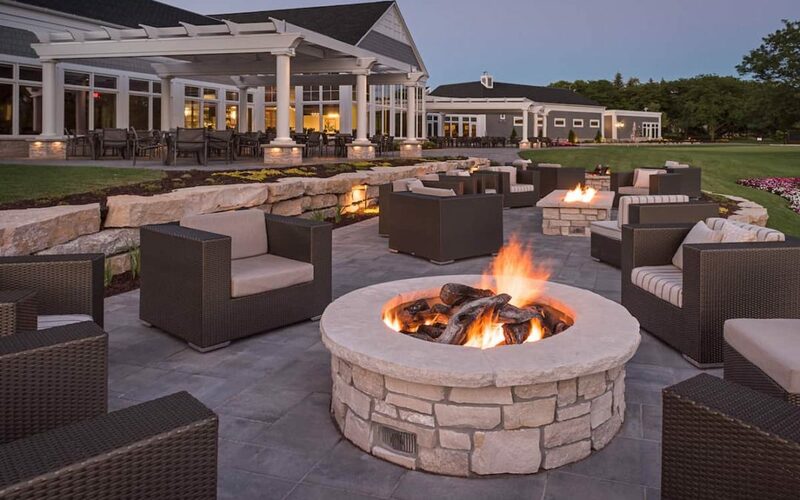 If you love bonfires, then this is your ultimate upgrade. Contact us with your ideas for your backyard transformation. We offer free consultations. Live your best outdoor life!